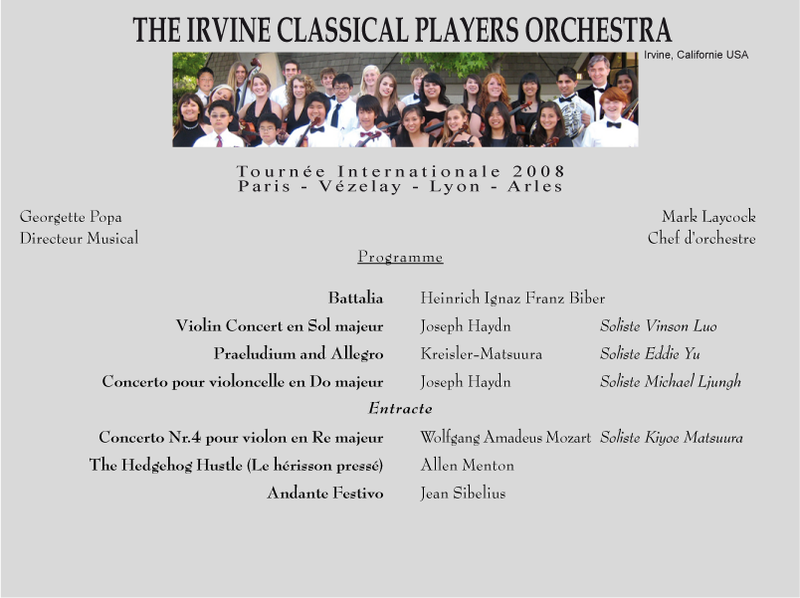 THE IRVINE CLASSICAL PLAYERS ORCHESTRA, S.California, orchestre de jeunes musiciens, dirigés par Georgette Popa. Young musicians orchestra, Georgette Popa director. Irvine Classical Players Orchestra Founder and Music Director Georgette Popa has maintained a private violin studio in Irvine, California for 24 years and is a former professor of violin at the Superior Conservatory of Music in Lyon France. She has taught violin for the University of California at Irvine, Saddleback College, California State University at Fullerton and Concordia University. Her teaching career includes numerous requests for international master classes in France, Switzerland, Germany and Holland. In addition to her teaching credits she has performed extensively in Europe and the United States. Her active performance career has included numerous studio recordings for film and television. She holds a Masters Degree in Performance from the Conservatory of Music G. Dima in Cluj- Napoca, Romania and completed a three-year PhD. program at the Conservatory of Music in Paris, France. sunt mandru de tine, scuze pentru tutuire. It is impossible for today’s human beings to avoid each other as this time purely belongs to the public relations. brilliant Post ! I like your writing and your blog and i waiting for your next research thanks for the information.